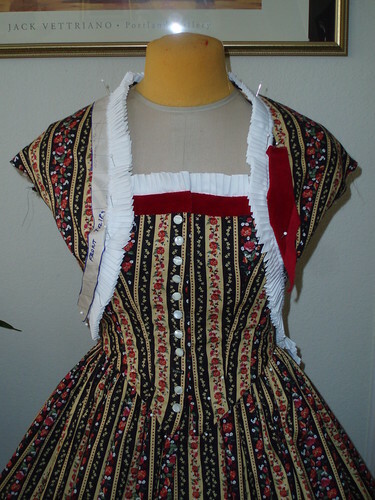 An 1861-3 reproduction day dress that was made as a mockup for a Dickens Fair dress. Pattern: Janet Arnold, "Patterns of Fashion 2", 1977, pages 20-21, c.1861-3 A Day Dress, The London Museum. Black, yellow, and red patterned striped cotton skirt, cartridge pleated into set waistband, hidden front pockets, back placket with hooks and eyes. Yellow cotton polyester hem fold back to reveal red velvet inset reveres. 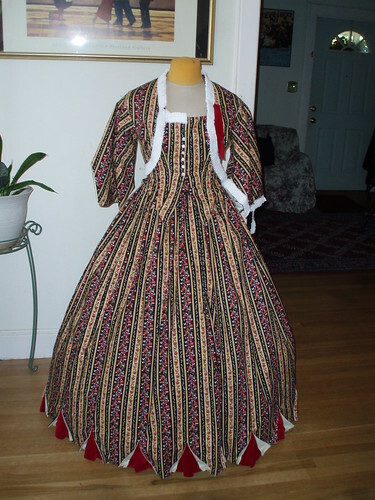 Pattern: Based on Janet Arnold, "Patterns of Fashion 2", 1977, pages 20-21, c.1861-3 A Day Dress, The London Museum. 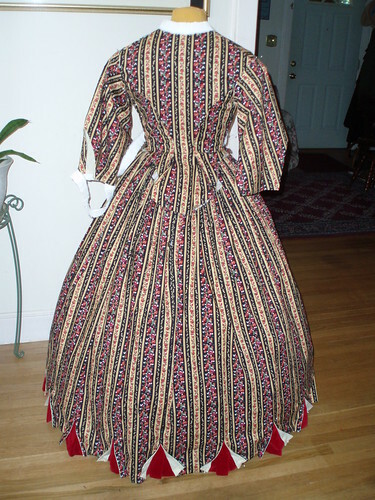 Different pleating and less yardage used making it more of a 1850s style skirt instead of elliptical 1860s. Bodice fit is getting better. But besides, the velvet not being sewn on straight, what's wrong with this picture? 1. The buttons are not centered which means they need to be moved and the side seams readjusted. 2. The white trim looks too bright. After having spent all that time pleating and ironing, trying to decide whether to get different colored fabric for the pleated trim. Flash photography tends to overexpose the white areas which then loses the depth of the pleating. So, will look okay in person, but the photos won't be as nice. Will ponder momentarily before deciding to continue with white or go get different fabric. Testing out the Janet Arnold Patterns of Fashion 2 1861-3 Day Dress pattern for someone about my size by making the bodice for a dress I had already started. Skirt was already cartridge pleated at waist and a smaller circumference. Need to make adjustments all over including shortening and taking in with armhole adjustment. Have already ripped out once, but need to rip out, again. Like lots of pleated trim is being made. Here's a beginning shot with trim and sleeves pinned on. If you go to Flickr and click All Sizes, you can see that the white part is pleated trim.